Yosmerith Hoyos did not speak English before she started kindergarten, as her mother had immigrated to Las Vegas just a few years prior from Columbia. Despite early challenges, she persevered and went on to achieve academic success. She has excelled at Advanced Technologies Academy earning a 4.57 GPA, while taking eight AP courses in diverse disciplines including AP Psychology and AP Calculus AB. Yosmerith is in the legal studies program, and helps mentor new A-TECH Mavericks as a student ambassador. She is a top-rated competitive gymnast and works as an instructor at GYMCATS. Yosmerith remains an active member of the A-TECH community and is a board member of the Hispanic Student Union (HSU). Under her leadership, HSU has tripled its membership and organized several cultural events. Her teachers describe Yosmerith as self-reflective and driven yet humble. Yosemerith earned a QuestBridge full-ride scholarship to Macalester College in St. Paul, Minnesota to study neurosurgery this fall. 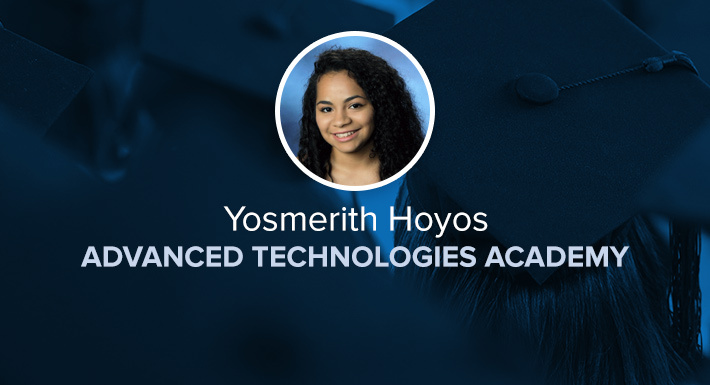 Congratulations to Star Graduate Yosmerith Hoyos of A-TECH!